Eve Lundsten is a research technician in the Continental Margins lab with Charlie Paull’s group. She assists with all aspects of preparing for and carrying out oceanographic expeditions to help us learn more about the processes that shape the seafloor. 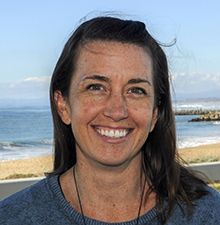 She helps the Continental Margins lab organize, catalogue and manage a wide range of datasets pertaining to seafloor dynamics. Eve processes high resolution, AUV collected, multibeam bathymetric data using MB Systems to generate accurate grids depicting the morphologies on the seafloor especially in marine canyons, and in areas with gas hydrate present. Eve uses mapping and graphical software to make elegant, clear, and descriptive maps, posters, figures, and plots for further analysis and publication.